Ms. Marvel's First Big Foe As An Avenger? Gentrification. Ms. Marvel has kicked off a new series this week, and there’s big changes ahead for Kamala Khan. She’s now a known hero in Jersey City—and not just any hero, but one of Earth’s mightiest. But it wouldn’t be Ms. Marvel if she was just fighting giant monsters and supervillains. She has her own delightful problems to deal with. Spoilers ahead for Ms. Marvel #1, by G. Willow Wilson, Takeshi Miyazawa, Adrian Alphona, and Ian Herring. Ms. Marvel #1 pretty much picks up where the series had mostly left off—Kamala’s burgeoning romance with Bruno has hit a dead end (now that he has a new girlfriend), she still has to balance school life with superheroics. The only real difference now is that she’s living her wildest dream: she’s an Avenger. In many ways, it’s made her life even harder—long days at school, evenings Avenging, and then nights of homework (that even Tony Stark won’t help with). But above all, it’s kept Kamala from being distracted, while her neighborhood is being swept from underneath her by new businesses. And not just any business—a redevelopment corporation that’s using Ms. Marvel’s likeness to put a friendly face on their steady Gentrification of Jersey. 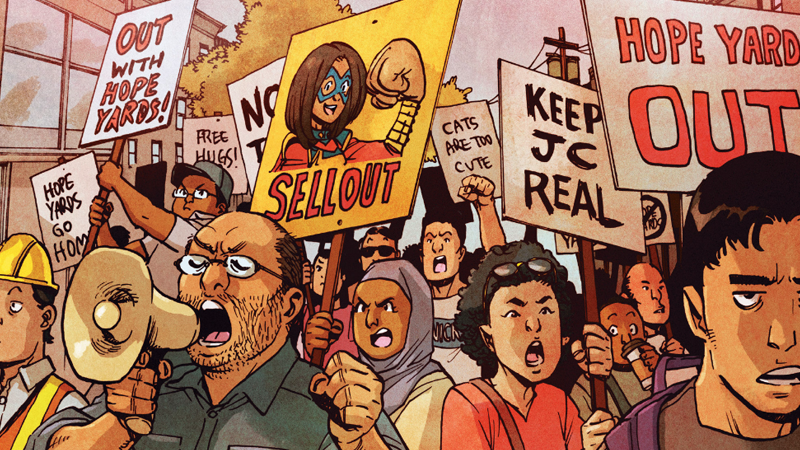 This is the exact sort of thing that Ms. Marvel has always been about—almost like no other superhero these days, Kamala is very specifically a defender of her home and its community. She’s almost out of place (only almost though) fighting giant psychic frogs or sinister supervillains. Developers and Gentrification? That’s so up Ms. Marvel’s street it hurts. It’s a wonderful thing to develop into the first arc of this series. But it also serves to remind Kamala that her actions as a hero have had consequences far beyond her reach. There’s a great moment when she finds herself facing an anti-gentrification protest shortly after fighting some strangely highly-armed goons working for the re-developer (who has plans to gentrify all of Jersey—it’s wouldn’t be a superhero comic if there weren’t sinister goons and plans to take over the world city! ), and realize her fame’s become more than just about her, her family, and her friends. For better or worse, Kamala is now a symbol to many. She doesn’t know how to handle it, just as she doesn’t quite know how to handle the drama in her personal life at the moment. Especially said drama when it comes to Bruno. Angry mob behind them, Kamala finally confronts him about his new girlfriend, only to be reminded that Bruno is doing exactly what he told her to do after their shared moment together: live his life without her, because she’s Ms. Marvel now. We get a flashback to how Bruno met his girlfriend (including a return specifically for the flashbacks by Ms. Marvel’s formerly solo but now secondary artist, Adrian Alphona, a lovely touch), and it’s all about Bruno essentially letting go of Kamala, to let her be Ms. Marvel. It’s tragic and familiar in so many superhero stories, but stings so sharply for a character like Kamala Khan because so much of her story—and so much of what’s made her a great character over the last few years—is about her life beyond the spectacle of being Ms. Marvel, those connections and relationships. It’s a sad moment when he does so—but as ever with Ms. Marvel and teen drama, it’s really well done. This sets Kamala on a path of growing up, both as a hero and as a teenager, that makes us so happy to have this series back in our lives again.